GREAT CHAIR, SMOOTH UPHOLSTERY, FLAWLESS DESIGN! Nice to have these peeking through my dining room doorway within eyes view range while I'm sitting on my bastille dining chairs - I opted for the non-upholstered ones so it wouldn't be overkill when I paired them with these stools - never thought I had a flair for interior design but inmod makes it surprisingly easy! Better quality then I imagined they would be considering the prices, pretty much became an inmod junkie since they arrived! Thank you! 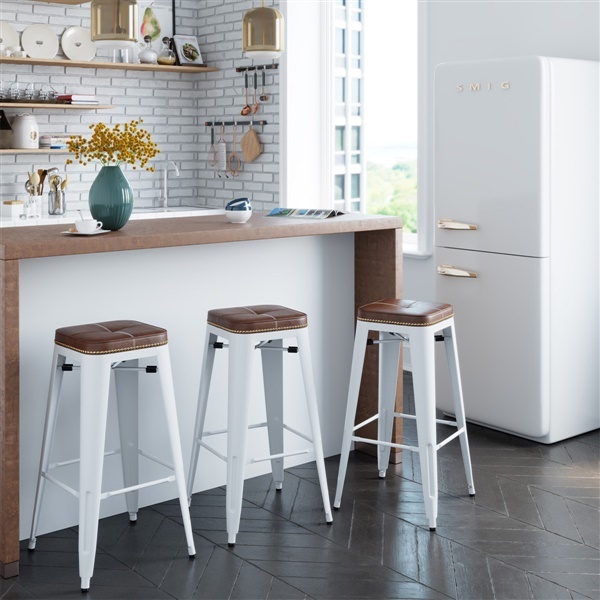 super cute addition to my kitchen, love the look especially the upholstered seat! cafe style is charming and the accent trim kicks it up a notch, gorgeous! I love the trim around the cushion and the contrasting colors between the seat and the legs, the entire design looks incredible, thank you!